Odin, Feldman & Pittleman Attorneys At The Annual Reston “ACE” Award Ceremony. 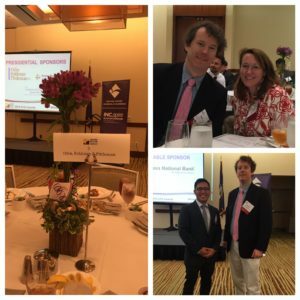 June 23, 2016 – Today Odin, Feldman & Pittleman attorneys Michelle DiCintio and Matthew Keller were honored for their participation in the Greater Reston Chamber of Commerce’s Government Contracting Committee, which just won the annual Reston “ACE” award for best chamber committee of the year. The committee was lauded for its significant achievements this past year connecting the local government contracting community to resources for growth. The committee’s annual, flagship event – the Annual NOVA B2G Matchmaking Conference and Small Business Expo – was particularly successful this year.